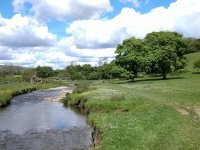 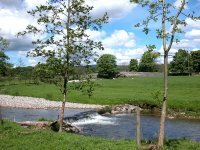 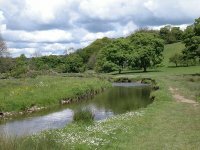 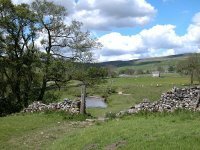 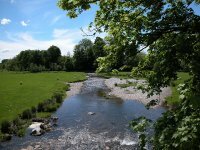 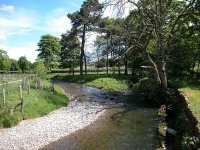 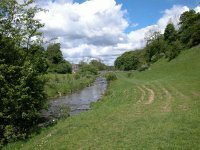 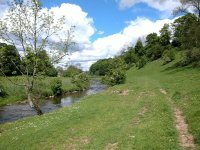 Today's walk takes us across the greater part of the Aire gap to reach the central part of the Pennine Way - the Yorkshire Dales National Park. 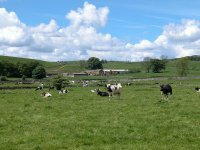 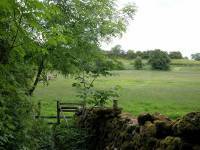 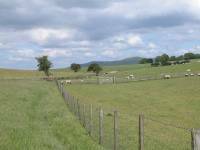 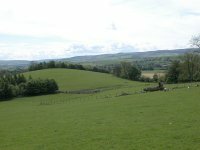 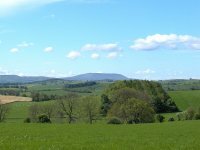 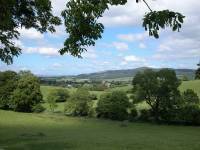 In the morning we cross the farms and pastures between Thornton and Gargrave, a green landscape of low hillocks, hedges, trees, and grazing livestock. 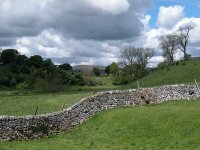 In the afternoon the Way crosses the low ridge of Eshton Moor, rich farming country rather than rough grasslands, and then wends it way along the upper Aire valley to the amazing limestone scenery of Malham. 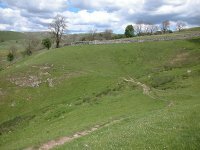 Pennine Way folklore tells us that if you reach Malham on a through hike then you'll complete the Pennine Way. 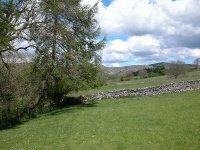 But before you rush off to do that, Malham and its surrounding invite leisurely exploration. 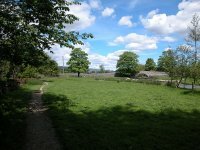 If you want a day off, take it here. 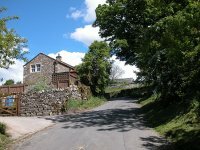 The Pennine Way leaves Thornton-in-Craven by Cam Lane, a residential road leaving the village to the northeast, a little to the east of the post office and the point where the route entered the village. 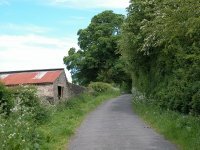 Cam Lane continued for a good deal longer than the map would suggest. 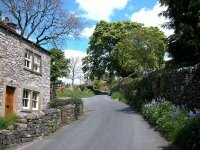 It continues to pass houses and cottages for a good half mile, and once out of the village the tarmac surface continues. 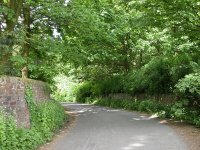 Follow the lane past two significant left-hand bends. 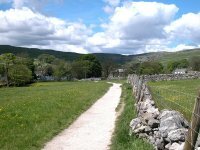 Just past the second bend, as you draw level with the recently rebuilt farmhouse of Town Hill, the Pennine Way forks off to the right for a footpath running diagonally across a pasture. 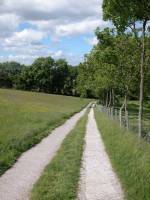 There is no path as such, just a ribbon of worn and scuffed grass. 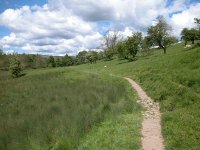 The route runs over the top of a small hill (first image below) and down to a line of bushes, where the Way crosses the small stream of Langber Beck. 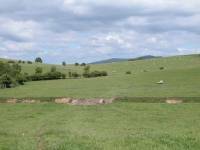 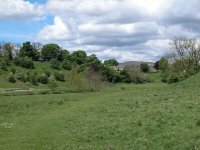 Once across the beck the route crosses the small hillock of Langber Hill, running diagonally across the pasture on a second sketchy path (second image below). 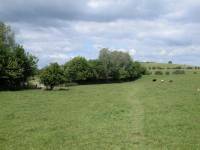 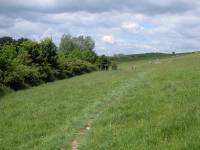 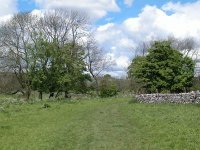 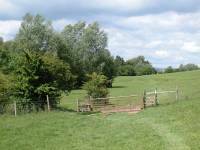 At a slight dip you cross a stile into another pasture; follow the sketchy path across its northeastern corner (third image below) to what appears to be a copse of trees. 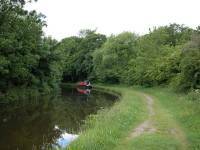 In fact these trees mark the bank of the Leeds - Liverpool Canal and the Pennine Way now adopts its towpath for a short distance. 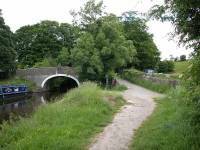 The PW reaches the Leeds - Liverpool canal not far south of the village of East Marton, where both the canal and the PW are crossed by the busy A59 road. 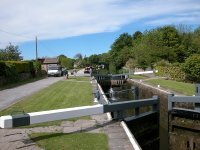 Thanks to this road and to the village, this stretch of the canal is busy and is a popular mooring point. 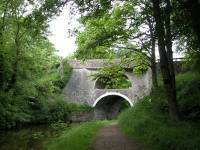 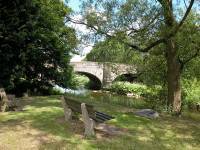 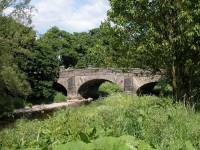 Soon after joining the towpath you reach bridge 160, a standard stone arch carrying a local road over the canal. 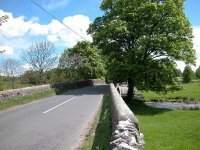 Immediately after this bridge is a fairly tight curve to the left, and as you round it an odd sight comes into view - a bridge on top of a bridge. 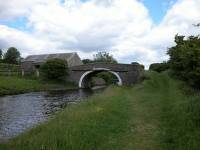 This curious double-arched structure carries the busy A59 road over the canal. 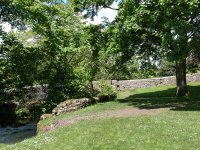 It would appear that after the original bridge was built the height of the road was raised to eliminate a dip, and as a consequence a second bridge was built on top of the first. 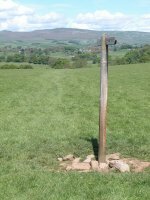 It looks odd, but it works. 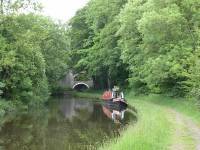 The major mooring area is just after bridge 161 (so watch you don't trip over any mooring ropes, and also be on the lookout for anglers). 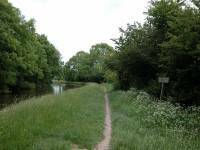 You quickly reach bridge 162, and it's here that you leave the canal towpath. 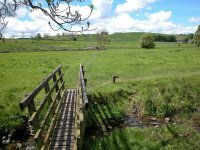 The next mile of the Pennine Way is notoriously difficult to navigate, and you need to keep your wits about you. 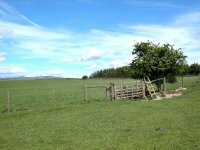 The basic secret is to keep your eye on the field boundaries, not always easy as temporary wire fences can come and go. 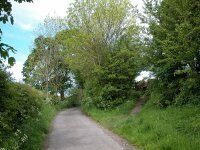 Go up the slip from the bridge to the track and start going east, but turn almost immediately left onto a farm road (first image above) that heads north, roughly parallel with the canal. 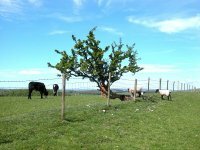 There are trees to the left, pastures to the right. 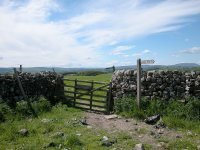 The first point of ambiguity is a Pennine Way sign that points, unhelpfully, slightly left of the farm road and might suggest that you should leave the road and start heading across the pasture. 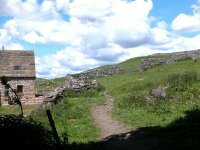 Don't. 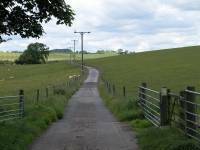 The PW leaves the farm road at the next field boundary. 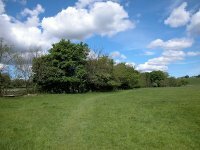 It is supposed to cross this pasture on the diagonal and head for the southeast corner of the little wood to the north, but I came a complete cropper here in 1988, and on my subsequent visit in 2003 I found the route illegally blocked with electric fences. 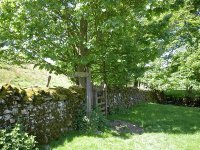 Assuming you find your way to the corner of the wood, pass to its right (second image above) and then stick close to the trees to find a half-hidden stile. 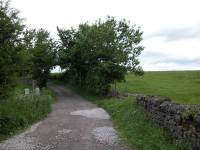 Cross this to follow a path just inside a stone wall marking the boundary of the wood. 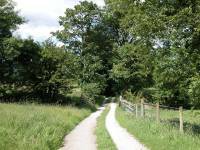 On exiting from the wood (third image above) cross a narrow pasture on the same bearing to come out onto a farm track. 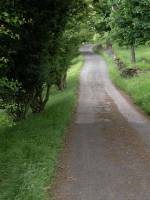 Yes, it's the same farm track you left a few minutes ago. 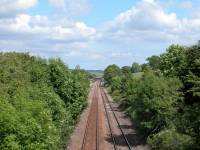 It would be tempting to recommend that you stay on this track initially to avoid the route finding intricacies. 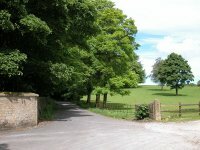 Turn east (right) onto the farm track and follow it for the short distance to a left-hand turn. 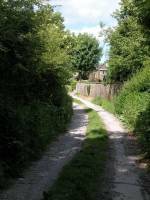 Go around this turn but then take a footpath heading diagonally to the right - it leaves the track at the point pictured in the first image above. 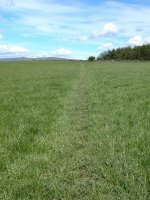 Once again there is no path as such, just a ribbon of worn grass that may be easy or hard to follow depending on the time of year. 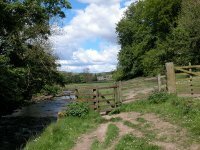 I remember getting thoroughly lost here in 1988. 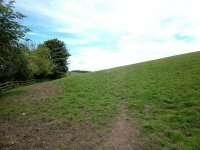 The trick would appear to be to head for the northeast corner of this pasture (second image above) and thereafter follow the course of Crickle Brook, staying immediately to its right. 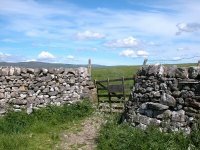 If the path is muddy, the skies are grey and temporary fences confuse your navigating skills, this can be a thoroughly frustrating part of the Pennine Way. 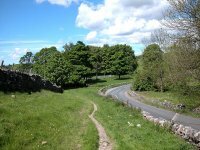 But if the sun is shining and the route is sufficiently clear to follow, then it is undoubtedly a rewarding and relaxing stretch. 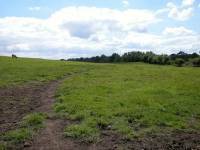 Just keep following the worn ribbon of grass - the images above will tell you roughly what to expect. 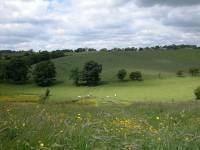 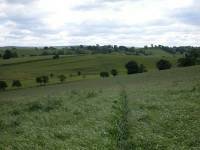 This is grazing country and you will be watched by clusters of sheep and cattle. 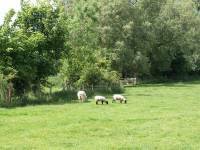 Sheep will tend to run off. 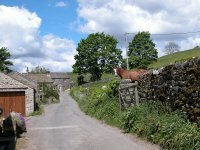 Cattle might do the same but can tend to be curious and might slowly approach you. 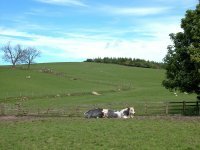 A sudden wave of the arms or a shout or two will usually dissuade them. 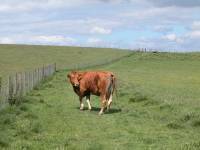 The only thing to beware of is getting between a cow and her calf or calves. 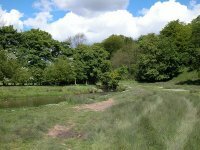 Crickle Brook and its accompanying hedge veers slightly right and peters out, and from here it's necessary to follow the enclosure boundaries once more. 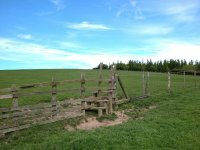 It shouldn't be too difficult, the next stile should always be in sight. 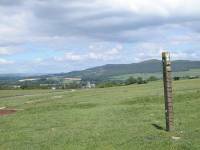 After crossing a stile or two you start to ascend the eastern shoulder of Scaleber Hill. 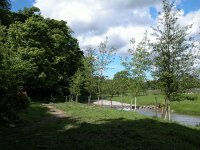 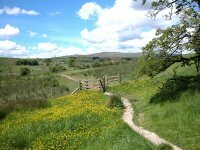 The scenery improves now, and you ascend to a prominent wooden pole that marks the crossing point of two footpaths, the Pennine Way and a local path going east-west. 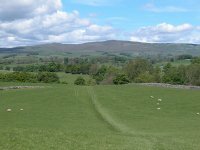 From here Gargrave begins to come into view a mile or so to the north, and if the day is clear you may get a glimpse of Pen-y-Ghent. 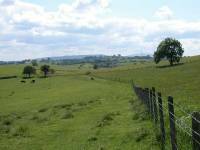 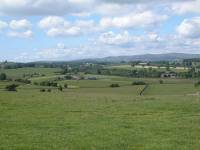 Descend north eastwards to Gargrave, keeping Scaleber farm just to your left. 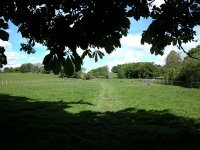 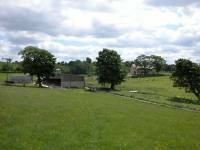 As you approach the far corner of the pasture you reach a bend in the farm road, which you now follow towards the town. 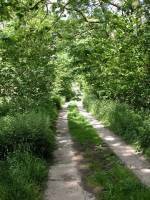 The farm road is a delightful interlude, running first alongside then into a small wood. 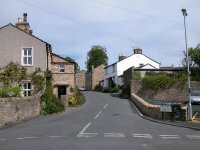 The farm road crosses the Skipton - Settle railway line (with Gargrave station in view a few hundred yards to the right). 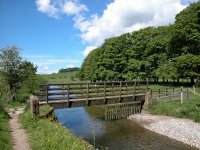 Just beyond the bridge the official route of the PW is shown turning off right to cross a pasture, but this appears not to be used much. 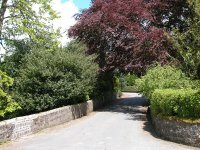 It's easier to stick to the farm lane until it emerges into Gargrave's first residential road. 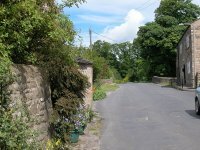 Turn right along this road and follow it to the lane leading to the church, then turn left and cross the bridge over the Aire into the centre of the village. 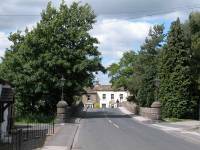 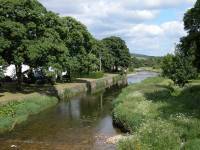 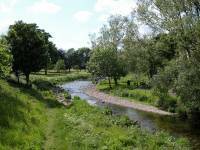 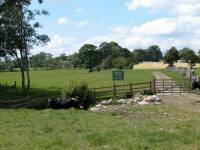 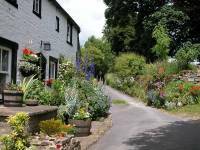 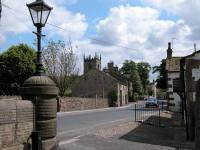 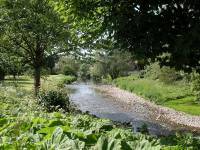 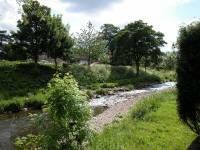 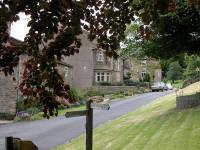 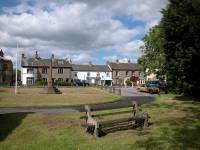 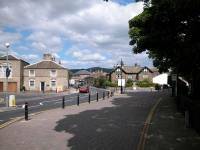 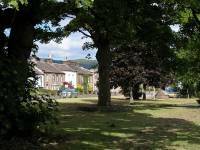 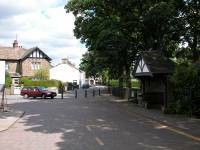 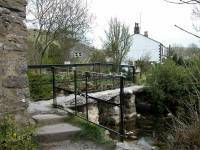 Gargrave is a pleasant enough village and is a useful provision point for Pennine Wayfarers. 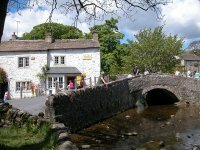 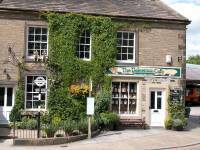 The Dalesman cafe, right on the corner of the village square, is one of the PW's more famous refreshment halts, and it features a milepost outside. 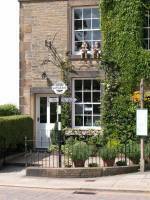 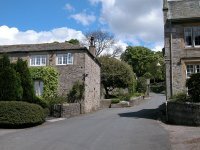 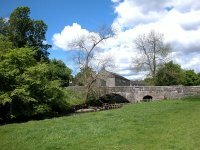 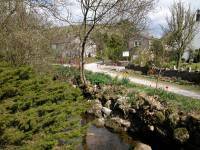 There are several places that offer bed and breakfast, and there are bus and rail services into Skipton. 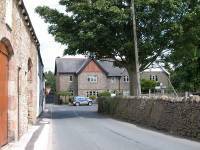 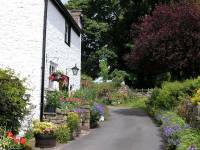 Leave Gargrave by the lane to the north, right by the Dalesman cafe. 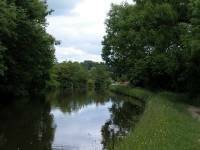 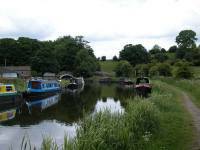 Soon aftewards we encounter the Leeds-Liverpool canal again, for the last time. 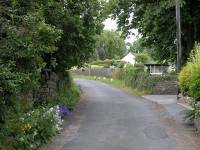 As it leaves the village our route twice goes straight on at junctions at which the main road curves round to the right, to end up following a narrow lane with a screen of trees to the right. 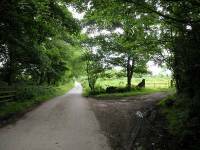 About a mile out of Gargrave, just as you reach the end of the wood standing to your right, look out for a footpath off to the right. 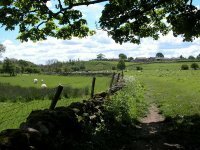 The Pennine Way follows this path over a stile and then begins to climb the slopes of Harrows Hill. 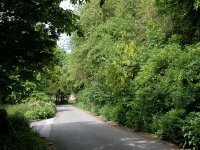 Harrows Hill can be confusing. 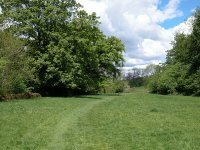 Once again there is no path as such and you're left to follow the slightly worn ribbon of grass as best you can. 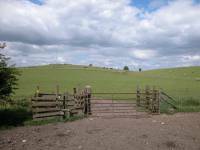 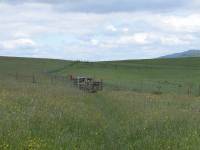 A further complication is that the hill is a convex slope and it's not always possible to see the next stile or gate. 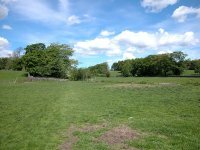 Keep left of the highest ground of the first pasture, curving around to the right on a level contour, and you should see the trees of Middle Plantation ahead of you; make for the leftmost corner of this wood. 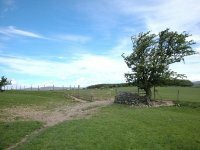 Then head for a stile in a fence a little way ahead to your left, cross it, and head uphill in the same direction to reach the leftmost corner of an L-shaped wood. 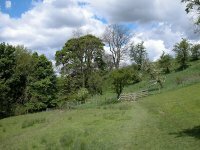 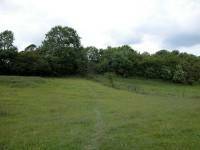 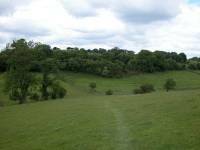 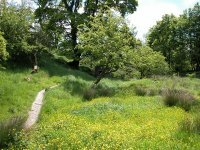 Stay more or less on the highest ground beyond the wood, crossing into another pasture, which you cross on the diagonal to reach a stile half way along its northwestern enclosure. 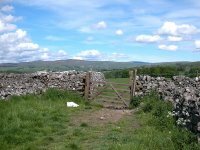 Should you veer too far to your right to a prominent gate you will doubtless see the sign, "Pennine Way, next stile". 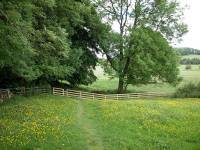 There should be a prominent wall about 250 yards to your right, running southeast to northwest, with a wood the other side; head across the next pasture making for the far end of the wood (you cross another transverse fence by a stile about halfway), and converge with the wall. 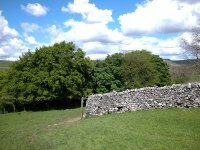 Now walk alongside the wall until you reach a prominent gate in a wall corner about 400m further on. 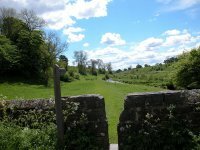 Go through the gate. 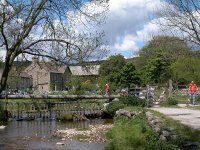 You've now entered the Yorkshire Dales National Park. 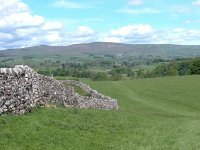 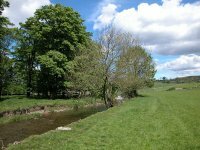 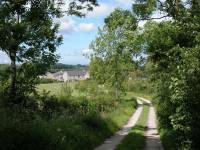 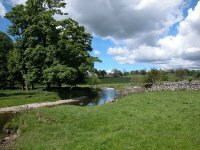 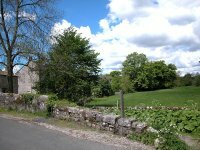 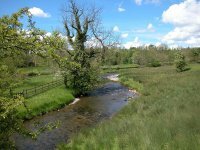 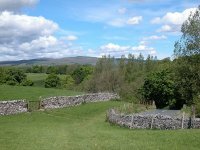 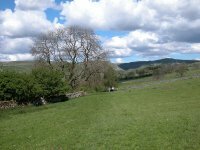 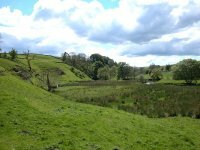 You enter the Dales among the most pleasant pastoral scenery, a vista of pastures and woods and walls and hedges, dotted here and there with farms and hamlets. 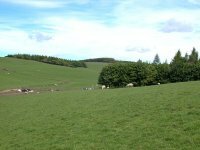 The PW should be reasonable easy to follow now as it descends the pastures of Eshton Moor in a north-northwesterly direction. 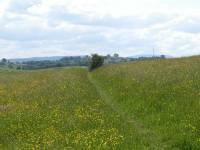 As before, navigate by the field boundaries. 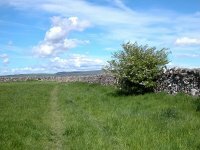 The path across Eshton Moor runs for a good mile, descending alongside a stone wall for part of the way. 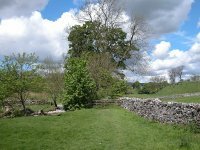 You will notice that you are gradually converging with the Malham road, and you reach this at the foot of quite a steep slope. 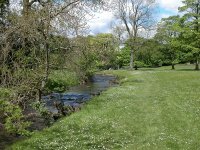 The Way is now sandwiched in between the road and a stone wall around a left-hand bend, whereupon you meet the river Aire once more. 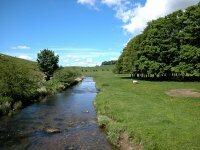 This is a most pleasant stretch of the Pennine Way. 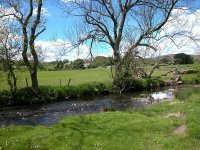 You're in a world of river meadows now, as you follow the Aire pretty much to its source at Aire Head Springs near Malham. 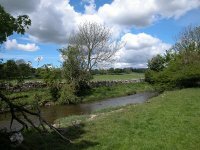 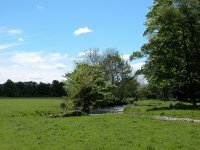 Cross a side stream by a footbridge then turn left to follow the west bank of the Aire for about half a mile as far as Newfield Bridge. 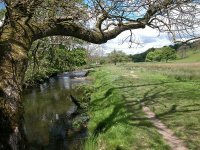 Turn right along the road and cross the river by Newfield Bridge, then turn left again to follow a series of paths, close to the east bank of the river, towards the village of Airton. 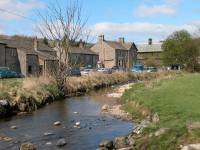 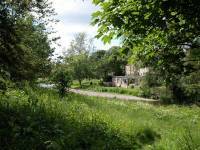 Airton village lays just to your left across the river. 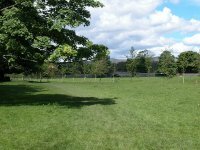 By all means take a look, though it has no facilities. 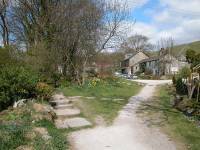 Cross the lane and continue to follow the Pennine Way as it winds lazily alongside the river in the afternoon sun. 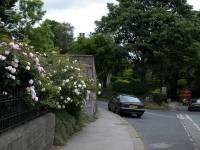 On a good day this is a most pleasant section and one not to be rushed. 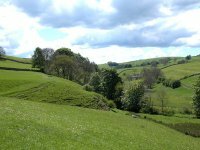 This section between Airton and Hanlith runs for a good mile and a half and the scenery improves as you approach Hanlith, with an increasing number of trees dotted about in the manner of a country park. 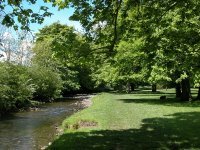 Hanlith is much like Airton - pleasant, but small and devoid of facilities (one begins to long for a pot of tea in a riverside garden). 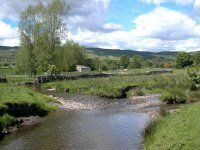 The Pennine Way forsakes the riverside here and leaves Hanlith by the lane to the right, which climbs quite steeply uphill. 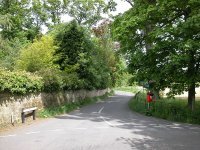 The route follows the lane around a left hand bend but leaves it shortly afterwards where the lane bends very sharply to the right. 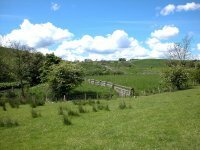 Follow the Way immediately north of a farmyard and around the brow of the hill now. 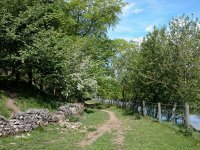 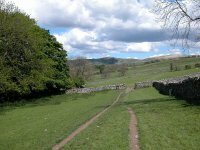 The going is surprisingly rough around here, but you are rewarded with your first views of Malham and the cove, and of Goredale Scar to the east..The route follows a fairly complex path around walls and patches of woodland, so follow the map carefully. 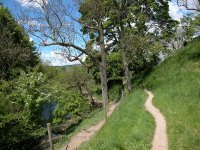 The river starts to converge from the left and the path goes fairly steeply downhill into a dell, with bushes and shrubs immediately to the left. 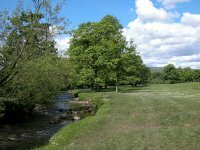 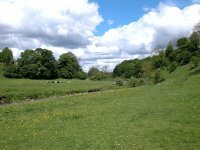 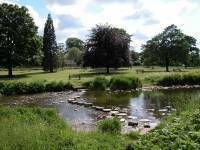 Just after you cross a footbridge look out for Aire Head Springs over to the right, where the Aire emerges from its underground course. 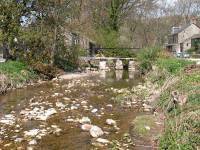 You will meet it again tomorrow at Watersinks. 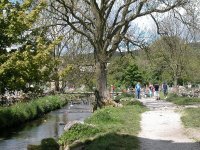 You cross just one more pasture before coming alongside Malham Beck, and here the half mile of relatively poor going comes to an end. 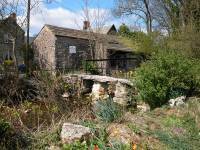 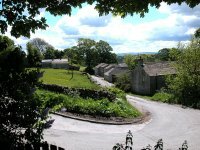 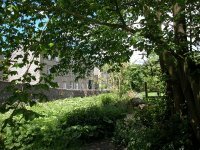 Malham is wonderful, a show village at the centre of a fascinating landscape. 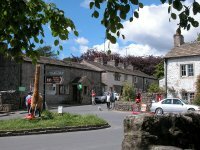 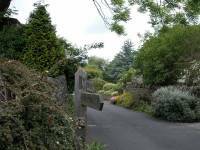 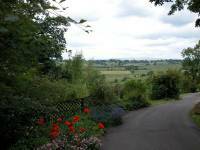 The village is kept "just so" by the national park authorities, to avoid it being spoiled by the ever increasing number of visitors. 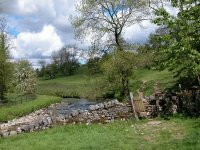 It's pictured and described fully on the next gallery, along with the scenic features that make it famous; Malham Cove, Malham Tarn, Goredale Scar and Janet's Foss. 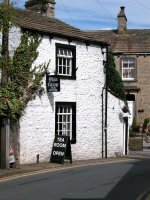 There are two hotels and several B&B's in the village, and a bus service (which really ought to be more frequent) into Skipton. 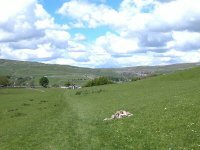 They say that if you make it as far as Malham on a through hike, then you'll complete the Pennine Way. 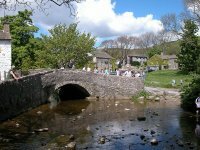 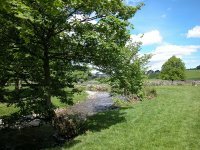 Malham is a good place for a day's rest, which you can spend visiting the scenic gems off route. 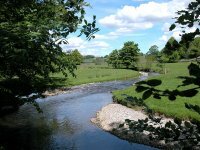 Available on CD - the high resolution (2560 x 1920 pixel) originals of the 2003 and 2005 images on this gallery. 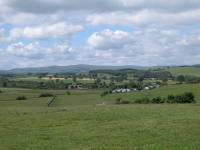 253 images, 379MB of data. 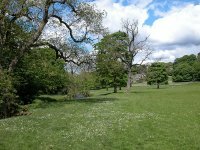 (includes some images not selected for the website). 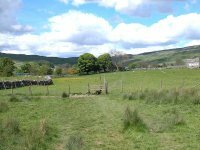 £6.00 inclusive of postage / packing.